The Comfy Cats website uses beautiful photographs of cats provided by the business owner and self professed cat lover, Louise Mavity. Comfy Cats provides a home visit cat sitting service in Solihull and the surrounding areas with tailor-made visits to suit both owner and the cat’s requirements. We worked with Louise to create the Comfy Cats logo and brand image and went on to develop the website with a focus on creating something personal and reassuring for prospective customers. 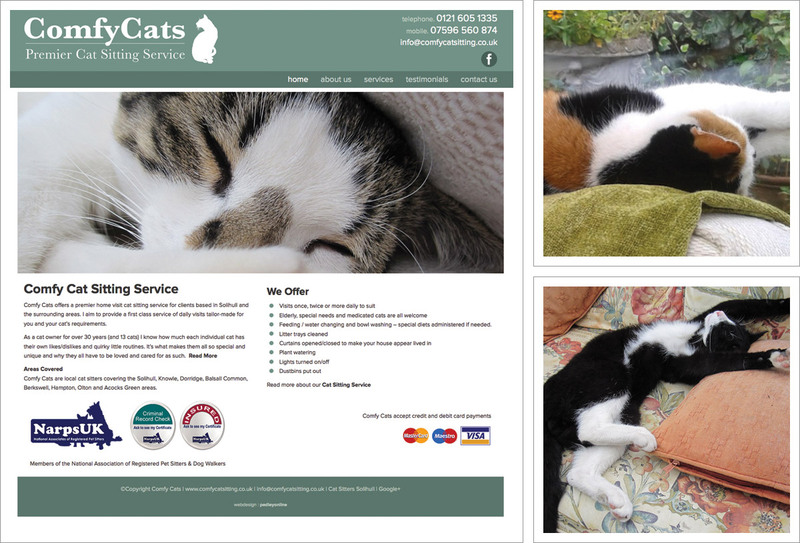 The website content includes background information which outlines Comfy Cat’s experience and life-long love of feline friends and is also backed up by good selection of highly complimentary customer testimonials. The Comfy Cats website is responsive / mobile friendly which means that it displays well on desktops, mobile phones and tablets. We also helped set up and style Facebook and Google+ pages and added the finishing touches to the website by adding a Comfy Cats Favicon.